Handa Opera on Sydney Harbour is an uncovered, all-weather event. We go ahead with performances in all weather. A large proportion of our audience travels from overseas and interstate to see the performance, and we’d hate to let them down by cancelling. Our performers are getting ready to go on this evening. We ask that audience members come prepared in warm and waterproof clothing. Biodegradable ponchos are being sold for $5 each this year. We donate profits from the sale of ponchos to Clean Up Australia. We will cancel a performance if there is danger to our performers or audience – which means an electrical storm (within a 10km radius) or extremely high winds and rain. Performances won’t be cancelled until 7.30pm or later so plan to travel to site for a 7.30 pm start. In 2019, West Side Story takes to the iconic stage at Handa Opera on Sydney Harbour. Raise a glass as the sun sets and drink in the view as you share a meal in one of the pop-up bars and restaurants on site. Then sit back to enjoy the enthralling show, complete with live orchestra hidden beneath the dramatic stage and fireworks in the balmy night air. On the mean streets of New York's West Side, two rival gangs strut their stuff. But when a Jet falls for a Shark, the stage is set for a rumble. Their wistful love story is studded with infectious songs including 'Somewhere', 'Maria', 'I Feel Pretty', 'America', 'Cool' and of course, 'Tonight'. An all-singing, all-dancing supporting cast takes on Bernstein’s brilliant score and Jerome Robbins’ original electrifying choreography. 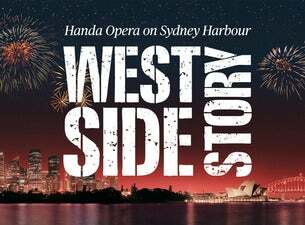 To extend their accessibility programs, Opera Australia have designated the performance of West Side Story on Sydney Harbour on 17 April 2019 as a relaxed performance. This style of performance is designed to ensure young adults with a disability and their families, or anyone who enjoys a relaxed environment, are able to enjoy the performance experience together. This relaxed performance will allow guests to come and go from their seats during the performance and venue lights will remain on at low levels. Some lighting or sound features of the show may be adjusted minimally but there are no significant differences to the production. The performance will be audio-described, and those who wish to will be able to read captions on handheld devices. A ‘Quiet Space’ will also be made available if a break from the show is needed and our staff can offer advice on other spaces if needed.